June 21, 2017: Improved support for automatically showing required form if no required message is specified. March 2, 2017: Updated submitted forms cookie to be persistent by default. Added new "is_persistent" option to disable this. March 1, 2017: Added support for "gwsa_requires_submission_redirect" option to allow automatically redirecting to a specific page if the user requires access. March 23, 2016: Added support for requiring a form to be submitted before any page can be accessed. Added support for storing submitted forms in user meta. 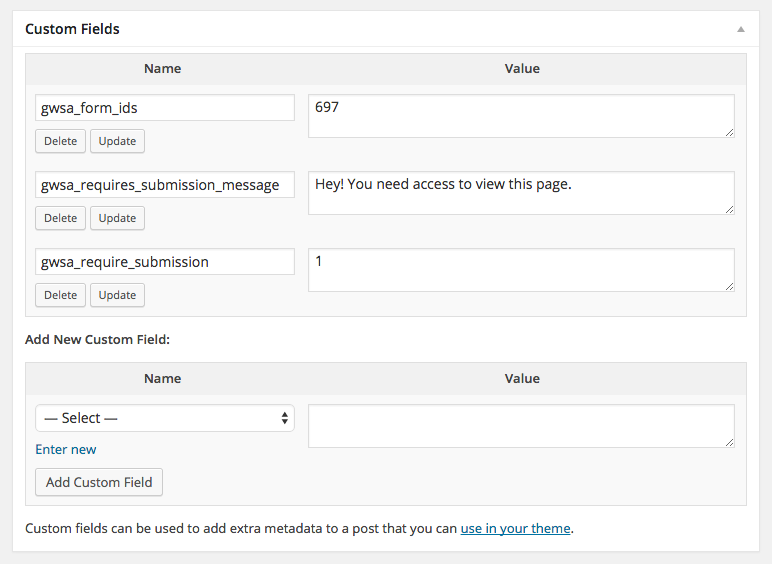 March 3, 2015: Added support for shortcodes in "gwsa_requires_submission_message" custom field. Fixed issue where json_decode() did not return an array. * Require that a form be submitted before a post or page can be accessed. * Description: Require that a form be submitted before a post or page can be accessed. // Replace form's action URL. // if the form is being loaded on an https page, that our action url is also https. // has specifically required form been submitted? You have a post or page you’d like to protect but you don’t want to require the user to sign up for a user account and you just don’t need a full-blown membership system. All you want to do is collect a few details about the user for your mailing list or CRM. This plugin provides an easy way to accomplish this. Any post-based content (that includes pages and custom post types) that support custom fields can be locked down. You set a few special custom fields and the Gravity Forms Submit to Access plugin takes care of the rest. Click the “Download Code” button above and save the file to your Desktop. Drop the file into your WordPress plugins folder via FTP – or – zip the file up and upload it via WordPress plugin uploader. Navigate to the Edit screen for any post, page, or any custom post type. Enable “Custom Fields” via the “Screen Options” at the top of the page. There is a good chance they are already enabled. Add a custom field named gwsa_require_submission with a value of 1. Add a custom field named gwsa_form_ids and set the value to the ID of whichever form the user should submit to gain access to this page. That’s it! For a complete list of the available options, read on. Add this custom field with a value of 1 to require a Gravity Form to be submitted to gain access. Add this custom field and set the value to the ID of the form which must be submitted to gain access to this page. If there are multiple forms that can be submitted to gain access, you may include them as a comma-delimited list (i.e. 1,2,3). If any form can be submitted to gain access to this page, do not add this custom field option. Override the default message that is displayed when the user does not have access to view the content of this page. Provide a URL to which the user will be redirected if they do not have access to view the content of this page. Define the default message that is displayed if the user does not have access to the content. This value will be overridden if a post-specific message is set via the gwsa_requires_submission_message custom field option. Defaults to 'Oops! You do not have access to this page.'. Enabling this option will allow the script to bypass any page/cookie caching by fetching the post content via AJAX. Defaults to false. If bypass_cache is enabled, this option allows you to control the loading message which is visible while the post content is being fetched via AJAX. The cookie that stores which forms have been submitted for the visitor is persistent by default. Set this to false to make the cookie session-based. This is a bare bones plugin. It uses WordPress’ custom fields UI to handle setting the options and advanced configuration should happen in the plugin. If this proves to be a popular resource, I’ll be happy to enhance it to be even easier to use. Did anything ever become of the interest in gating ACF content with this plugin? Just wondering if there are some code samples out there to filter out specific ACF fields, then add them back in after the form is filed out. Ideally, I’d like to show all of the page content as it is normally, but replace an ACF field for “Download” or “View” with a “Register” button until the form is filled in. This way, the page can act as a teaser, and then after the form capture, can show the link to access the content. Hi Sam, we haven’t made much progress in that direction. If you’re outputting your ACF fields via PHP in a template, you could make use of the has_access( $post_id ) method to check if the user has fulfilled the requirements for the current post. If not, you could show your own custom conditional content. Thanks. This proved to be the easiest to implement. The other odd thing I found is that the plugin wasn’t loading the default GF styles, and for some reason was also somehow dequeuing jquery.js and jquery-migrate.min.js from WordPress /wp-includes, so I had to re-queue those both in to the plugin code. It depends on how you’re loading the form. We can’t wait to make this plugin easier to use. Glad you were able to get it working for your needs. If the form is set up on another page, can it give the cookie then instead of the page that requires it? Hi Teri, yup. All form submissions are tracked when this snippet is active. This is actually how the demo is configured. Can this be used to restrict access to a Woocommerce product page? Currently it just restricts access to description text. I am not sure if the problem is on my end or the plugin has stopped working. I am usiing Gravity Forms 2.1.3 and Gravity Forms Submit to Access version 1.7, I followed the instruction as above on my publicly published page, but still I am not seeing any message or anything. I can see the content of the page. Hi Luzan, this is typically a configuration issue. It’s difficult to assess without access to your install. If you’re a Gravity Perks customer, we’ll be happy to provide support via the support form. Hm, not sure. Log in with FTP, remove the plugin, and see if that issue goes away. No one else has reported this issue so it seems to be specific to your configuration. Thanks! this worked. I first tried renaming it to just gw-gravity-forms-submit-to-access2 which I assumed would deactivate it at least but it was still not working. Deleting the folder worked though. Could it be clashing with a security plugin like ithemes? a real shame because I need a plugin that provides a download after a gravity form submission (including Stripe payment), I’ll try and find another solution. Hi, First of all. This is brilliant. Can we use this with ACF fields. I mean to say if a post has acf fields and can only access after form submission. It depends on how you have your ACF fields configured to be output. If they aren’t output within the_content, this probably won’t work out of the box. I have a page which I have included the requisite custom fields (gwsa_require_submission and gwsa_form_ids) when I go to this page I see the form appear. If I submit the form the page content loads. If I reload the page the form re-appears. If I open a new tab and navigate to this page the form appears, instead of the page content as I would expect. If I go to a secondary page with the same custom field values and the redirect field key/value it redirects instead of the content showing as I would expect. When I look at my developer tools I see that a cook (gwsa_submitted_forms) is set with value %5B1%5D. Do you (or anyone) have any clue why this is happening? Hey Thanks!!! This is an awesome Plugin! 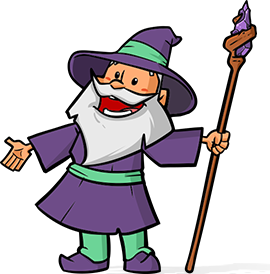 I’m asking folks to vote for logo via Gravity Forms… then once they’ve voted I give them a chance to win a prize if they’ll just give us a little more info. I only wanted people who voted for a logo to be given the opportunity to enter the contest. 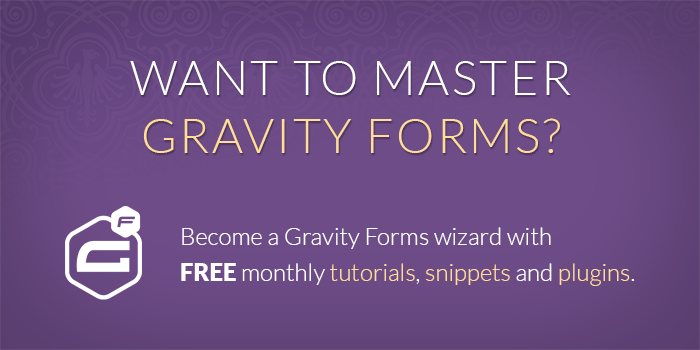 “Submit a Gravity Form to Access Content” was the magic bullet! Much appreciated! Is it possible that i can make the cookie session very small. Once user submit the form and go to restricted page. With in 30 seconds the cookie session expired now if user refresh the restricted page then he again need to fill the form. Is that possible? I’ve added the form to my single post template, but it seems if someone completes the form for any post, they can access all posts. Is it possible to collect this data for each post? Hi David, this feature is not currently supported. The restriction is not dependent on which post the form is submitted from but which form is submitted. Definitely something we’ll consider for a future version. I’m having a similar issue as David did, and try multiple ways to resolve this. The first way, we set the confirmation as a redirect to same page of the protected content. It just keep having the form reappear, only when we hit the submit form again (without entering any information), would the content appear. The second way, we set the confirmation as a redirect to a new page and had a link back to the protected content page. When they go back, the form still appears and not the content. It is using a child of the Divi theme. Is there something we are missing? Hi Scott, hard to say. This snippet is difficult to debug remotely and, unfortunately, we don’t have the throughput to provide hands-on support pro bono; however, if you’re a Gravity Perks customer, we’ll be happy to provide additional support via the support form.